Give the gift of health and wellness to the people you love and care about and who are currently participating in Illinois’ medical cannabis program with a gift certificate from Herbal Remedies Dispensary*. Under current regulations, patients are burdened with paying 100% out-of-pocket the cost of their medical cannabis and medical delivery systems. Many patients, including your loved one, are uninsured and may not have the means to stay on top of their healthcare needs. The gift of health and wellness is probably the best gift anyone could ever receive. An Herbal Remedies gift certificate allows the recipient to purchase what they want when they need it. Recipients can use their gift certificate towards the purchase of medicine and/or accessories. Gift certificates are available in any denomination with a minimum gift of $25.00. 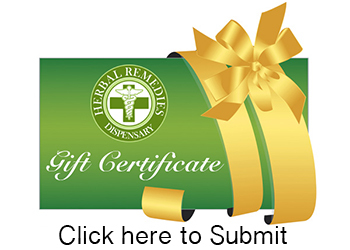 * Gift certificates can ONLY be purchased for registered medical cannabis patients within the State of Illinois and who have identified Herbal Remedies Dispensary as their designated dispensary.